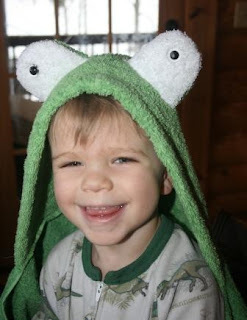 Have I mentioned Pierce is obsessed with frogs? Yes, yes, I know I have. 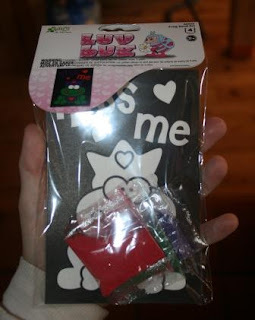 Well last week I won a giveaway from Yikes Twins and I was so excited. I found this giveaway through Etsy Giveaways. 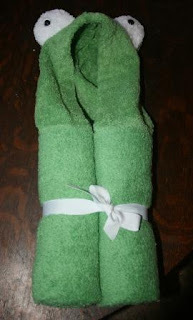 Yikes Twins has the cutest hooded towels I've ever seen. I really wanted Pierce to pick the monster towel when I found out he won. But no. Of course he went straight for Freddy Frog towel. It came in the mail a couple of days ago. Pierce tried it on right away. And then Reid insisted on trying it on but it was a little big. 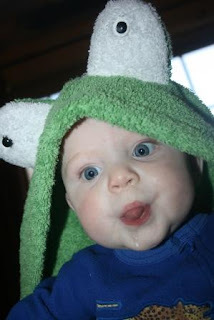 Reid is really good at making Froggy faces, don't you think? 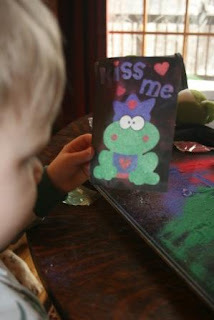 Pierce and I also did a frog art project for Valentine's. This is another goodie we picked up in the $1 bin at A.C. Moore. 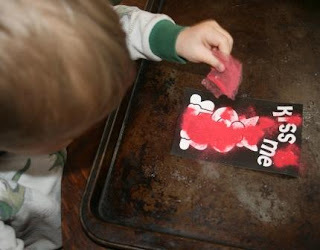 This turned out to be an excellent toddler art project. First off, it's simple (you just peel off the white parts which are stickers so then the sand will stick when you pour it on). 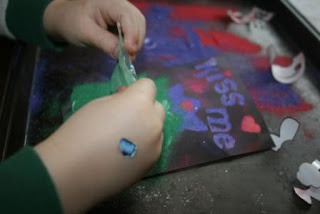 Secondly, it's slightly messy (but not TOO messy) and toddlers just love a good mess. Happy Valentine's! Paul and I had a $5 limit on Valentine's gifts this year because we're buying our train tickets to NYC for the marathon I'll be running in the fall. I got him a book categorizing different beers at the B+N 75% off sale plus a bag of Reese's peanut butter hearts. He got me an egg slicer and egg piercer for when we get our chickens and they hopefully start laying eggs.